by Angela Parker, AICP, CFM, and Nancy Veitch Katkin. Photos provided by Nancy Veitch Katkin. Geographic Information Systems (GIS) have become a standard tool in planning around the world. As more information becomes available, the consumers of that data expect it to be as accurate as possible. The Fairbanks North Star Borough in Alaska maintains a collection of satellite aerial images, some of which date back to 1938. In 2009, new aerial images were incorporated into the GIS database along with the archived ones, and the Borough’s GIS imagery began to evolve. An update to the aerial images was completed in 2010, and again in 2012. 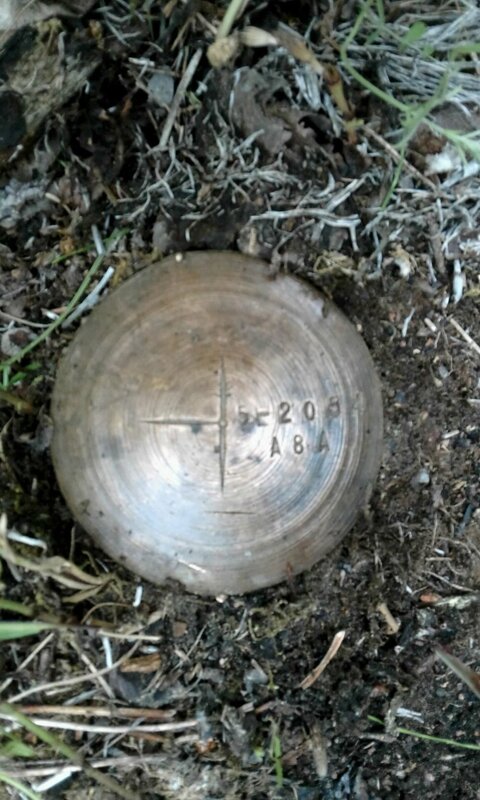 The 2012 images were tied to points on the ground with GPS with accuracy within three feet. When the parcel layer was overlaid on the aerial images, it was discovered that the two layers did not align well. This was to be expected since the aerial images had been completely updated, while the parcel layer had been pieced together over the years like a patchwork quilt. 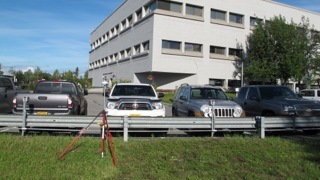 However, in some areas, the layers were misaligned almost 60 feet! Using the GIS to look at one of these areas, it could appear that a home was encroaching almost entirely onto another property. The Borough staff knew that something needed to be done; however, hiring a surveyor to resurvey the entire borough was out of the question. In 2013, a small budget was allotted to the task of correcting the parcel layer. Staff decided that it would be better to completely redraw the parcel layer rather than try to correct the existing layer. 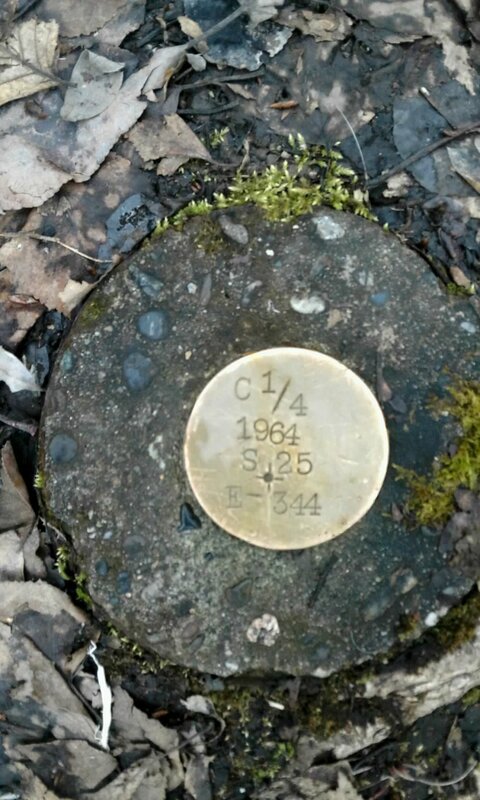 Under the plan laid out, the Borough staff would use existing plat information to gather potential monuments to locate in the field, and two GIS technicians (temporary positions specifically for this project) would attempt to collect GPS coordinates on each monument. And so the work began. During the winter, staff researched potential monuments using existing plat data. In March 2014, an ad was placed for the temporary positions. By April, the Borough had hired one technician for the project but was unable to fill the second position. (The office already employed other GIS technicians.) The work went forward, however. 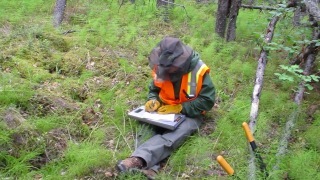 The previously collected plat information was provided to the technician in the form of paper maps, as well as downloaded onto the GPS equipment for use in the field. During the summer of 2014, 100 usable points were collected in the area of Harding Lake. This area was chosen as the starting point due to the large misalignment (approximately 60 feet) and small lot sizes (some are only 40 feet wide). Full mosquito and rain gear. Research the scheduled area of the collection with the Assessing Department. The Assessors are frequently out in the field; they are aware of properties that may not welcome visitors and can help avoid unpleasant encounters. Contact property owners to let them know someone will be in the area and what they will be doing. Many of the property owners know exactly where their monuments are and are happy to help locate them, thus saving a time-consuming search. A monument can appear to be in a perfect location for collection using subdivision plats and aerial photography but can be impossible to collect due to terrain, the tree canopy, or other issues. Use of contour mapping and 3-D GIS software can help in the selection of ideal monuments for GPS collection. Monuments in the right-of-way are usually easy to locate and collect, but traffic and safety can be an issue. The most useful monuments are those marking section corners or other aliquot parts. Use monuments that have been set within the last ten years, if possible. They are more likely to be undisturbed and easier to find. Older monuments can be used when there are no other available monuments, but the search may be difficult. The weather has an effect on the GPS connection to the satellites. If it’s raining, it’s not going to be a good day to collect information, anyway. In rough terrain and remote locations, it is best not to go alone. Daily test collection near office. 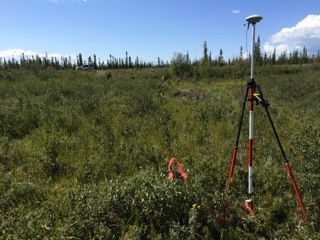 My job as a GIS Tech for the Fairbanks North Star Borough is to unearth and GPS old survey monuments. 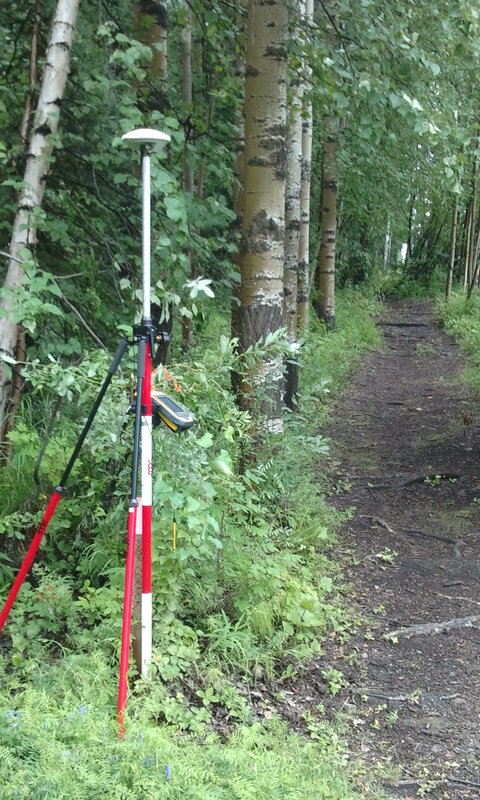 But, as I hike through the Alaskan Bush, with my magnetic locator in one hand and Juno (a handheld GPS unit) in the other, I really feel like I’m treasure hunting. With about 800 monuments to track each season, I get to explore beautiful, remote regions of Interior Alaska every day. It’s magnificent, and I cannot lie—it’s great fun. On long daily hikes, I sometimes entertain myself by guessing the type of monument I will ultimately discover. 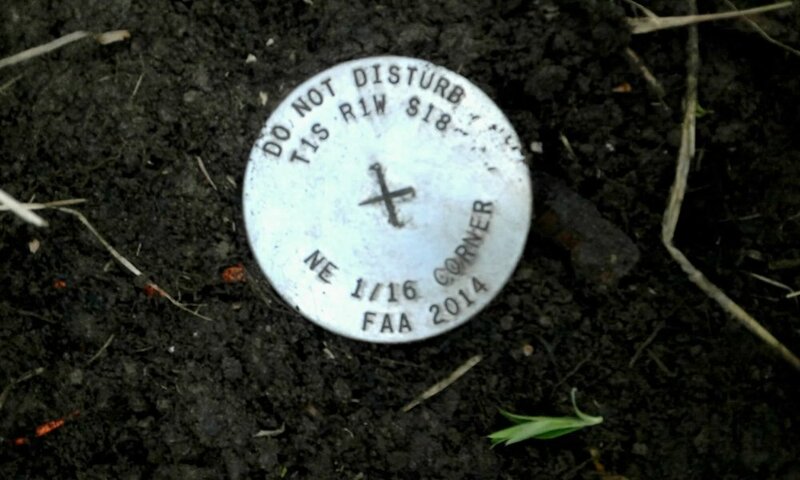 I am continually amazed by the variety of survey markers out there. Sure, I’ve found hundreds of your standard 5/8” rebar w/ 1 1/2” aluminum caps. 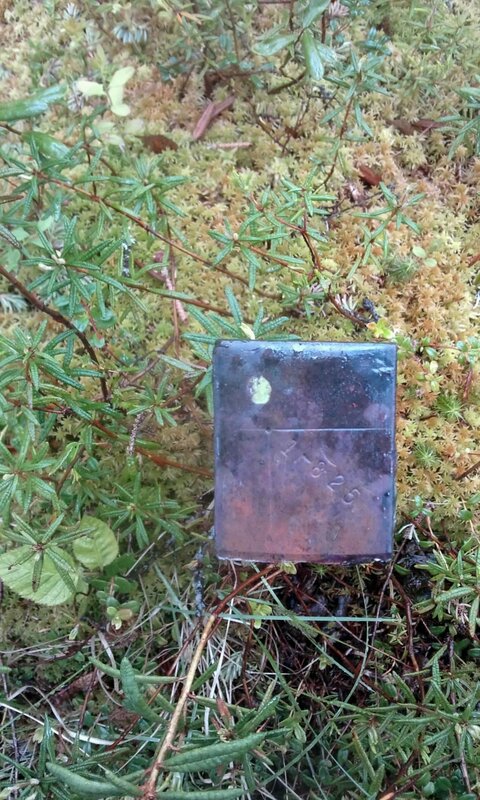 But, here in Alaska, far away from the roads, where there is nothing but narrow game trails and a few overgrown CAT trails, I uncovered old brass General Land Office monuments—the earliest date, 1911, hand-stamped with a field die. I find the 1920s and 1930s gold placer markers—squares of forged bronze, stamped with corner and mineral survey numbers. But, my favorite is a ROW monument that was set by the Alaska Railroad in 1987. It depicts a Gold Rush-era, narrow-gauge steam locomotive. It’s beautiful—and, truly a treasure. I am intrigued by these old monuments—but, maybe more so by their original setters. I ruminate on the men as I hike. I wonder how they managed so long ago. 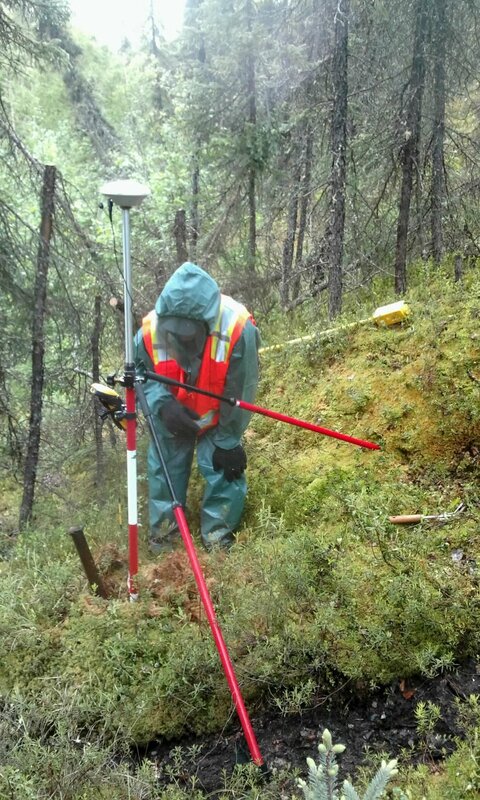 This is not easy—trudging through deep wet tundra or over steep rock outcroppings—and, I don’t have to haul bulky survey equipment or drag heavy chains. And, I know my high-tech breathable clothing far surpasses their wool counterparts in our extreme Alaskan weather. But, in the end, what we truly share is the adventure. The Alaskan Bush is always an adventure. You never know what’s around the corner... Wildlife abounds, from gangly moose calves to hungry lone wolves, from curious ravens to guarded bald eaglets. Then, there are the two-legged animals you encounter. 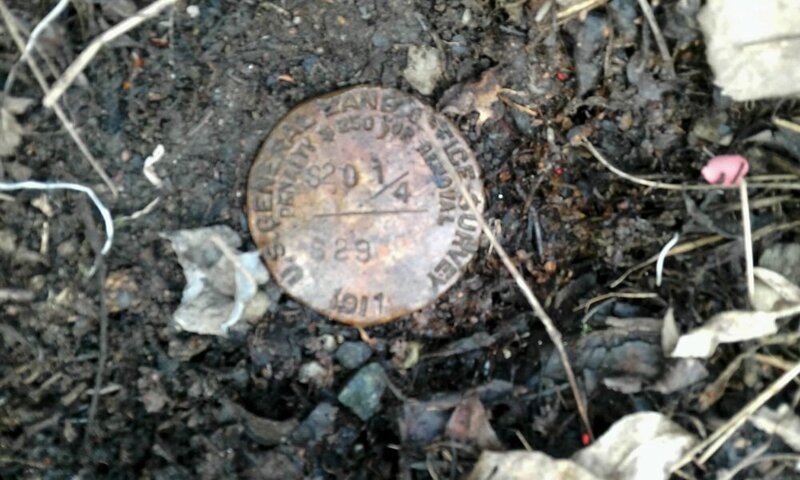 I’ve met reclusive and cantankerous old gold miners, and then frontier families with barefoot girls giggling in delight at the squeal of my metal detector’s new-found treasure. Click each photo to view it in a larger lightbox. 1911 GLO Quarter Corner Monument. 1911 GLO Section Corner Monument. 1952 BLM Sixteenth Corner Monument. 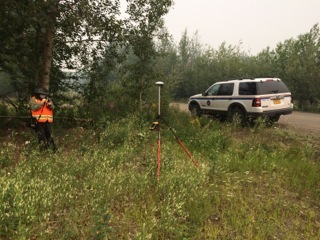 AK Railroad ROW & Mineral Survey Monument. Rectangle Mineral Survey Monument Circa 1920s. USSR & MC Mineral Survey Monument. 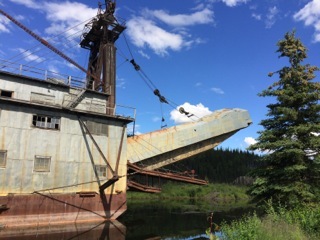 GLO Monument below surface in permafrost. Which is the right monument? I’d say I work alone in the field, but it seems more often than not, I’m accompanied by someone or something. Most often? It’s a horde of mosquitoes. What can I say? They like me. After all, I’m the only meal for miles… On some days, those little suckers are thick as clouds. On those days, while I wait on my GPS captures, I develop a whole new appreciation for my head net. I love to watch those pint-sized parasites feverishly trying to squeeze their way through the netting—and, without success. Through my regular GPS rituals, I have become fascinated by my fellow mosquitoes with their varied sizes, unique markings, and bizarre flight patterns. 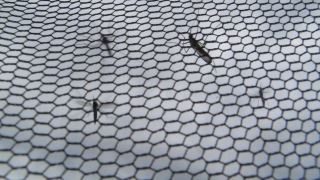 I now know there are 35 species of mosquitoes in Alaska—and, it’s unquestionably them against me. In all my GPS adventures, I am happy to report: I have never had a run-in with a grizz. But, let’s be clear. I make a concerted effort NOT to run into bears. When I’m in the Bush, I always look for a sign before I enter a new area, I make a lot of noise, and I listen carefully to the forest around me. I am truly fortunate that, during my three years in the field, my only encounter with a bear has been from behind the wheel of my truck. While blissfully snacking on my lunch, a wild-eyed moose burst out of the brush 20 feet in front of me. Close on her heels was a black bear, claws ripping at the ground and dirt flying as he closed in on the panicked moose. My jaw dropped, my sandwich landed in my lap, and I shook uncontrollably with the adrenaline rush—and this, from inside the safety of my vehicle! I now have a new-found appreciation for the term “Ford Tough,” too. Animal near North Pole, AK. A snapshot of the GIS with the new parcel layer overlaying the original parcel layer. The new layer is the blue; the old layer is red. Nancy’s work in the field allowed the Borough GIS technicians in the office to use the collected points, along with existing subdivision plats, to redraw the parcel layer to approximately the same accuracy level as the aerial photography layer. The points collected, processed and accepted were used to realign the parcel layer and provided tangible proof to the Borough Assembly that the project was successful. Money was appropriated to continue the project for 2015. Lessons learned as noted allowed the work to move forward quickly and efficiently. GPS collections were taken in the farthest corners of the Borough and then moved inward towards the more populated areas. The number of usable points tripled in 2015 to over 300! In 2016, the work was streamlined even further—GIS technicians in the office divided the remainder of the Borough into sections and determined exactly how many points they needed in each section in order to successfully realign the parcel layer. Only a few points were required in each section, and the collection activities were greatly streamlined, as a result. The end result is that the collection process has been completed and the GIS technicians in the office can now finish the realignment and publish the completed parcel layer for both staff and public use. At the start of the project, it was estimated that the work would be completed in five to ten years. It is satisfying to have beaten those projections and to have a parcel layer that is accurate to within three feet rather than 60 feet. The borough data is now more accurate and can better assist borough staff in completing projects and analyses. The public can have more confidence in the accuracy of the borough’s GIS data and are more likely to avoid confusion and misinformation. Angela Parker, AICP, CFM, is the Platting Officer with Fairbanks North Star Borough Community Planning in Alaska. She is the president of the Western Planning Resources, INC. Board of Directors. 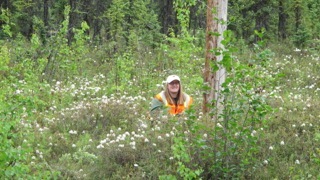 Nancy Veitch Katkin is the GIS Tech with Fairbanks North Star Borough Community Planning in Alaska.